The SUN LINE ensures fun in the sun without regrets. With a high quality natural ingredient complex and Konnyaku®, the SUN LINE offers optimal protection and care for healthy tanning, even for those with hypersensitive skin. 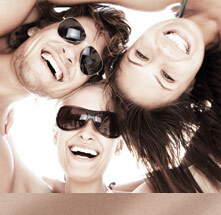 The skin is up to 90 per cent protected by light and solar filters while still ensuring a natural tan. Richtig Sonnen Step 1 - VOR DEM SONNEN - die optimale Vorbereitung!